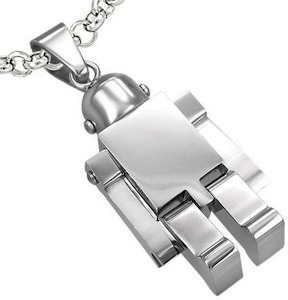 If robots are you thing then you have to check out this amazing looking robot necklace. The necklace is 28 inch long and on it you find a metal gold tone robot that is about 2.5 inch long and has wiggly arms and legs and black rhinestone eyes. Having this robot with you everyday is just fun. And this robot necklace comes in a nice jewelry bag so that it even makes for a fun robot present for someone that deceivers some fun robot jewelry. As this robot looks so cute you just want to adopt him into your life right now. So come get your own Robot Pendant Necklace. Do you want to carry around you medical information in an easy way? This medical ID necklace is clearly marked so that people in the medical profession know what it is and it is a flash drive of 4gb that can store data of you. You can use the included software to write down all your info about medication and conditions but you can also just store files on there so that the doctor does not have to use the software. It does not matter how you use it but this medical necklace can save your life if it has the important information about your medical conditions on it. And sure it is waterproof so you can wear it in the rain. 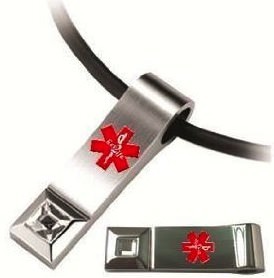 Come have a closer look at this Medical ID Necklace Flash Drive. Do you want a robot that is with you all the time? A robot necklace could do that and this little robot wants to be your favorite jewellery. The robot is made from stainless steel and can move arms and legs. And this is a complete necklace, actually it is 3 necklaces and 1 pendant. Yes this robot comes with 3 different necklaces to make it fit perfectly with your look. 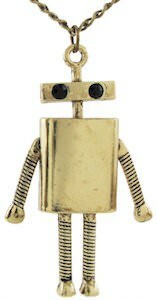 This shiny little robot wants to be your friend so come and check out this Stainless Steel Robot Necklace. Our favorite time lord travels in time and space using his Tardis and now you can find this amazing machine on a necklace. 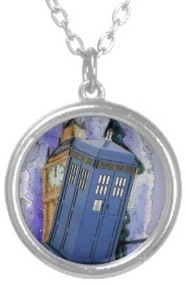 The round pendant shows the Big Ben the famous landmark from London and the blue Tardis flying in front of it. Of course we will never be sure if Doctor Who is in the Tardis but at least you have some prove it is real. If you would like a Tardis necklace then you are in luck as anyone can order this fine piece of jewelry witch comes with a nice 18″ chain and of course makes the perfect give. And if you don’t like a silver finish then you are in luck as it also comes in gold. come and get your own Doctor Who Tardis Necklace. Green cufflinks that is something way more fun then boring plain metal colored cufflinks. 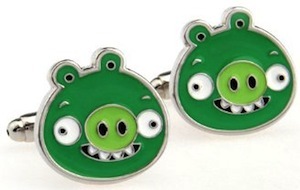 And these cufflinks are not just green no the looks like the pigs from the Angry Birds game. Each cufflinks has the face of a green pig on it. So now you suite becomes part of you gaming habits. Come check out these fun green Angry Birds Pig Cufflinks. This cute robot is made out of silver toned metal with rhinestone eyes and he can moves his arms and legs freely while around you neck. 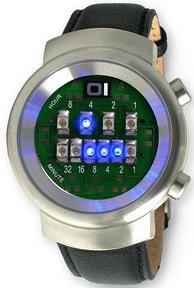 And the robot comes with a 18″ silver plated nickel free chain to make it a complete set. If you know a robot collector that can use a nice necklace then what are you waiting for come and order your Robot Necklace. Carrying a USB flash drive can be kind annoying specially if you forget to take it. But if you are a women and are looking for a fun bracelet then this hearts bracelet can be ideal for you. In the hearts is a 16GB USB flash drive hidden that can be folded out so that you can access you data. So now you can wear a nice bracelet and have your USB flash storage available when you want it. Come check out this Hearts Bracelet With USB Flash Drive. Gears of Wars players you are in luck as we found you two Cog tags. And these are not in game tags no they are real and hang on a necklace. Each tag has one blank side and the other side is engraved. One tag has the Gears of War logo on it and the other tag says “PROPERTY OF THE COALITION OF ORDERED GOVERNMENTS”. And of course these are licensed Gear of War merchandise. 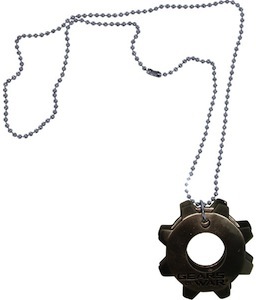 So if you are a true Gears of Wars player then you just have to get this Gears of War Metal Cog Tags Necklace. With Facebook going to the stock exchange all those suits that are making money on them need some nice cufflinks to celebrate that. And so now there are like button cufflinks. Of course if you are not making money on but like things then these can still be super fun when you wear a nice shirt or suit. The Facebook like button cufflinks are made out of stainless steel so they will last you a lifetime. Don’t forget to like this post and then order your own Facebook Like Button Cufflinks.